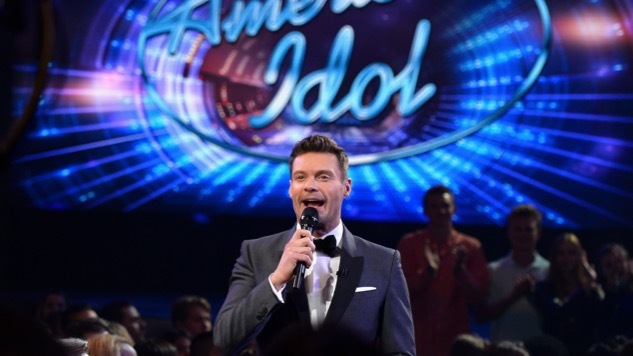 Is Ryan Seacrest Returning to a New American Idol? With the dearly departed American Idol almost certain to return to the airwaves in 2018, rumors are now swirling that ABC is eyeing Ryan Seacrest to once again host the L.A.-based show—despite his brand new gig co-hosting Live With Kelly and Ryan in New York, as well as a reported new $73 million (!) deal to remain a host on iHeartRadio. According to TMZ, producers at ABC (the first iteration of American Idol, which aired from 2002 to 2016, was on FOX) aren’t giving up on the prospect of Seacrest resuming the role that made him a household name. It would, however, require the 42-year walking grin to make multiple trips between the coasts every week—shooting Live with Ripa in New York on Thursdays and pretaping Friday’s show, flying to Los Angeles to tape American Idol on Sundays, flying back to New York for Live on Monday mornings, returning to L.A. to tape the Idol results show on Monday afternoon, and then back to New York for Tuesday morning’s Live. Luckily, he wouldn’t have to fly United. Thanks in large part to the Kardashians, Seacrest is one of the wealthiest honchos in the music industry, and would further be helped by a reported $73 million deal to remain a host on iHeartRadio, according to Radar. One problem: TMZ reports that ABC hasn’t formally approached Seacrest, and also wants the new Idol to air on Monday nights, opposite NBC’s “The Voice,” which would make hosting extremely difficult for him.